The blended, beautiful singing of the choir floats through the auditorium, delighting the audience. They wait in anticipation as the orchestra creeps in… a tone and a half higher than the choir. It’s happened to the best of us. However much ‘smiling’ or ‘thinking high’ you’ve been doing the bloomin’ piece has gone as flat as that soufflé you once tried to impress your mother in law with. It’s the ultimate downfall of a cappella singing (that’s singing without accompaniment for the non Italian speaking or anyone who has not succumbed to Gareth Malone’s charms). Now the trick is not to look like anything has gone wrong. You must master the art of looking serene and knowing, as if Bach or Tchaikovsky had intended a key change at that point, in a surprising precursor to the tactic favoured by popular music ballad writers when they’ve run out of ideas and feel that simply belting the music out a note higher will move things along nicely. You must maintain this look, even as your conductor is piercing you with a gaze that would slay dragons. Correct pitching is a tricky thing at the best of times. In large choirs it can be even more challenging; there always seem to be some people (cough*tenors*cough) whose sense of pitch seems to be ever so slightly south of the norm, as if rooted in the Baroque period. A cappella singing requires choirs to have an incredible collective sense of musicality, of rhythm and pitch, and that’s what makes it amazing. And a little scary to perform. Of course, it’s not the end of the world if the pitch goes a little wonky. Some pieces don’t have any accompaniment at all, so who is going to notice if you go off key? No one really, apart from possibly those cursed with perfect pitch and the basses, who may suddenly find themselves having to find low notes previously unheard by the human race. But I think they like the chance to show off their growling skills. So why spend all that time rehearsing, holding your breath as the rehearsal pianist plonks his fingers down on the chord you ‘should’ be singing? Because when it goes right, it is the very best of what choirs have to offer. For all choirs performing a cappella soon, particularly those who, like us, are taking up the challenge of Benjamin Britten in this wonderful anniversary week: may your melodies ring out, may your conductor’s brow be unfurrowed, and may your pitch be perfect. CBSO Chorus Director Simon Halsey gave me some food for thought as he warmed up the 900-strong crowd who turned up to sing Handel’s Messiah together at Symphony Hall last Sunday. He asked different age groups to stand up. There were teenagers to octogenarians in the room, all willing to give up half a day to sing a piece composed over 250 years ago together. And why? Partly because of the music. 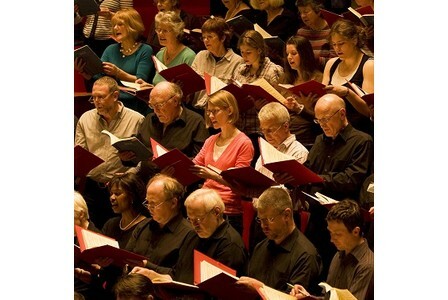 The Messiah is one of the most loved and frequently performed pieces of choral music (although not by the CBSO Chorus as it happens). The Hallelujah Chorus has become part of our culture. A year 8 student I was teaching this week was singing it in their Science lesson. I have no idea why, as I don’t think it has a connection with recycling, but they were still aware of it. Although I dread to think what they would have said if I’d asked them where the music was from. Anyway. Why else? The simple experience of singing with other people. Simon talked to this scratch choir about the way that singing can create communities. As our society changes, I think that creating and maintaining communities has become a challenge. Many people feel disconnected from each other, and singing is a way to change that. Now I move house a lot, and while a colleague’s spiritual home is a library, mine is a choir. One of the first things I do when I move to a new area is find one to join. Many of my good friends are people I’ve met at a choir rehearsal. There’s nothing like spending a few hours giggling on the back row of the sopranos to cement a friendship. But it’s more than that. There is something about a group of people singing together that creates a unique bond. However, many people will say, if asked, that they don’t sing, that they are tone deaf, that singing is not a part of their lives. I would bet that would include quite a number of the people you will hear bellowing Bread of Heaven or Swing Low Sweet Chariot this weekend at the rugby. In reality, almost anyone can be trained to sing in pitch and in time. Gareth Malone has been trying to prove this very point on our TV screens for the last few years. He’s tackled teenage boys, youth offenders, council estates and workplaces in an effort to prove that singing really is for everyone. And who could fail to be moved by the military wives choir, singing their hearts out while their partners were away fighting? I loved that they felt their choir really gave them a voice, a way to express how they were feeling and an outlet for their emotions as they waiting for their loved ones to come home. But I don’t think people watch these shows just because they are interested in music. They watch them for the journey from reluctant participant to confident soloist, for the emotions as people perform together for the first time, for the sense of achievement and pride. These communities were built, and they continue to develop and support people through whatever type of music they enjoy. And it’s not just face to face communities being created. Composer and conductor Eric Whitacre has found a way to use technology to bring people together through music. Watch his inspiring TED talk about his virtual choir project to hear his discuss how, even though his singers never met, they still feel connected through the shared experience. So for those of you whose last experience of communal singing was a school assembly, then why not try out a choir? There are hundreds of them out there, singing all types of music. You don’t need to be able to read music for all of them, and it’s not all pieces that were written 250 years ago. Give it a go. It’s like nothing else in this world.